Presale tickets can be purchased at LRHS or the MISD Athletics Office during business hours. The Lake Ridge Football team will be selling playoff T-shirts at all lunches on Thursday, November 29th. Shirts are $20 each and you may purchase the shirts with cash, credit, or check. All students who bring in a toy or donate a $1 will receive a wristband and be allowed to attend the 9:00 a.m. Lake Ridge basketball game this Thursday during second block. Please see Mrs. Stinson to purchase a wristband before the end of second block. Students must have a wristband to leave class. Student Council will be set up to exchange toys for wristbands during first block Thursday. Students must check in with their 2nd block teacher before going to the game. Toy donations for the game will be in addition to the toys you collect in your classes, so please don't include these in your counts. Students may exchange toys for wristbands at reception and in E-100 (The Student Council room) all day and on each floor near the elevators before classes. Students cannot bring a toy to the door at the game. They must have their ticket before the beginning of 2nd block on Thursday. Students will only be allowed to attend the Lake Ridge game. Lost wristbands will not be replaced. The Gay/Straight Alliance will be meeting tomorrow (November 28th) in room E-145. We will discuss Toys for Tots and community service opportunities. We hope to see you there. Sophomore class t-chirts are now on sale. This year we have ordered the soft style short sleeve t-shirt in green. 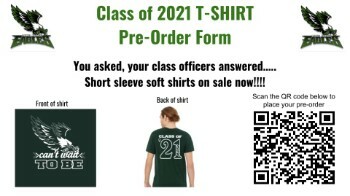 There are flyers posted throughout the school with QR codes to pre-order the t-shirts. Payment is due by December 14th to Ms. Garcia in room A-217. The next meeting for the African Student Organization will be held on Thursday, November 29th in room A-142 from 3:00 p.m. to 4:00 p.m. Your last chance to purchase Lake Ridge Baseball spirit gear is this Wednesday, November 28th. All orders and payment must be turning in on Wednesday. If you would like to order one see Coach Ross in room A-151. Are you interested in volunteering at Mission Arlington this holiday season? Get to the counseling office and pick up a permission slip to volunteer on Friday, December 7th. We will travel over via bus during the school day to serve and return before the end of the school day. The first 75 students to submit a permission slip will be selected to participate. The deadline to turn in your permission slip is this Friday, November 30th. If you received a slip on Thursday or Friday before Thanksgiving break, you are on the bus for the SMU field trip. Do not forget money for food, dress for the weather and meet in the cafeteria after 1st period. For those of you that missed this opportunity, we will have 2 more college field trips this spring. Congratulations to the Lady Eagles Varsity Basketball team for their success at the McDonald's Invitational in Pasadena! The Lady Eagles went 5-0 at the tournament, defeating Clear Falls for the Gold Bracket Championship, making it the best finish in school history. Vivian Nguyen medalled in all seven events and was the top overall scorer in the district! George Feigle, Chris Ricks, Eden Chen, Matt brown, Adasia Wilkes, Sahil Nayebkhil, Stephen Austin, Emily Rangel, and Summer Johnson all medalled in various events as well. If you are going to the UIL tournament and you have not turned in your permission slip come see Mr. Gartman in room A-259. The library will be closed next week for testing. EOC testing will be taking place next week in the library. The library and the hallway outside of the library will be closed all week. If you are scheduled to test next week you will receive a reminder the day before you are to test. If you have a Ben Barber class on the day of your test, do not go there for your morning class. You need to come to Lake Ridge at 7:25 a.m. and report to the library. It’s not too late to join the Vietnamese Students Association! Come today after school and join the VSA in Mr. Austin’s room A-226.